The new APBI Consensus Statement published by ASTRO is a clinically meaningful step forward in the validation of partial breast irradiation for selected patients with early stage breast cancer. The American Society of Radiation Oncology (ASTRO) has published an update to its Consensus Statement on Accelerated Partial Breast Irradiation (APBI) in the journal Practical Radiation Oncology confirming the use of electron beam IORT as an effective modality for the treatment of suitable patients with invasive breast cancer. Referencing the multivariate analysis of the ELIOT trial, the ASTRO task force recognized that “patients with invasive cancer fitting the suitable criteria had a very low rate of IBTR” (Ipsilateral Breast Tumor Recurrence of approximately 1.5% over 5 years). 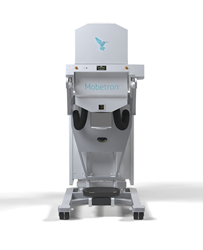 This new milestone distinguishes the IntraOp® Mobetron® from all other IORT treatment options and further validates that two (2) minutes of precision targeted electron beam treatment with the Mobetron can replace six weeks of conventional, post-operative external beam x-ray radiation of the entire breast. For qualified patients with breast cancer this means faster treatment, faster recovery and significantly fewer side effects, as non-involved tissue is spared. “The new APBI Consensus Statement published by ASTRO is a clinically meaningful step forward in the validation of partial breast irradiation for selected patients with early stage breast cancer. At Stanford, we have been pioneering APBI using single fraction IORT for over 15 years and can attest to the favorable results not only from an oncological perspective but also in terms of quality of life for our patients,” stated Dr. Kathleen Horst Radiation Oncologist at Stanford Cancer Institute. “As the data from randomized trials continue to mature, we will improve our understanding of which radiation techniques and which patients are most optimal for APBI treatment,” noted Dr. Horst. “The updated ASTRO APBI Consensus Statement is a significant and welcome development. For nearly 20 years, Mobetron has been the gold standard for IORT, delivering safe, consistent results for tens of thousands of patients,” said Bruce M. Khouri, President & CEO of IntraOp. “We are very pleased that ASTRO has finally affirmed the efficacy of a single treatment with electrons, which carries the potential of replacing up to 30 treatments of traditional whole breast irradiation, while delivering a statistically equivalent IBTR with little to no side effects,” Khouri added. “We are particularly gratified that ASTRO has validated the difference between electron-beam IORT and low energy x-ray IORT. With our mounting body of solid clinical evidence, patiently and methodically accumulated over decades, along with the growing trend of patients demanding better cosmetic results and improved quality of life, more and more cancer centers are recognizing Mobetron electron IORT as a critical modality in the fight against cancer” said IntraOp Vice President of Global Sales, Derek T. DeScioli.